← SR13 CLOSED near Millfield / Morristown due to traffic accident, avoid this area!! 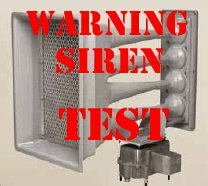 The outdoor emergency warning sirens in Nelsonville, The Plains and New Marshfield will be tested at 12 noon on Wednesday, October 1, 2014, with a one minute sounding of the sirens. Local residents are asked not to call local emergency agencies inquiring why the sirens are sounding. When the National Weather Service initiates a Severe Thunderstorm Warning (winds 58+ mph, large hail, severe lightening and heavy rains), for an area that includes areas of Athens County. When a public safety emergency occurs the sirens will be used to alert the public of emergencies such as hazardous materials incidents and civil disturbances. Go immediately to a safe area in your home or building, if high winds, severe thunder and lightning are present. Carry a battery operated radio or NOAA all hazard alert radio to your safe area. You will know when the storm or emergency has passed and when it is clear to leave your safe area. Athens County SIRENS DO NOT identify specific types of storms or emergencies, therefore you should immediately seek shelter and tune to local television or radio for further information.